Please accept my deep sympathy for your kitten. It looks lovely as lovely and funny cat no wonder everybody loved it. We have been sad to hear this too. We are so sad about Meowza, too!! We loved him playing in the dirt!! We shall miss him lots!! I just broke down with tears again reading this. Thanks for your love and support. It means a lot to me. And I am sure Meowza is happily reunited with his family that have crossed over. And his friend Cece, he missed his friend when he crossed, equally suddenly. 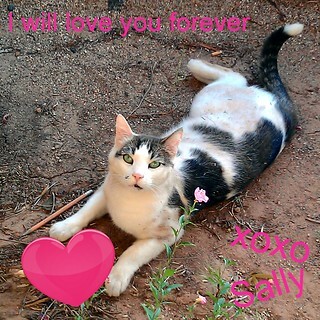 He will look forward to seeing his Sally too.